The Fair-Rutherford House stood here from c. 1850 until it was demolished in 2004. 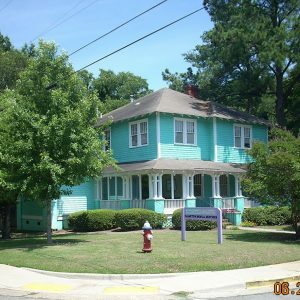 Built for Dr. Samuel Fair, it passed through several owners before 1905, when William H. Rutherford (1852-1910) bought and enlarged it. The Rutherford House was built in 1924-25 for Carrie Rutherford, daughter-in-law of W.H. Rutherford. Her son Dr. Harry B. Rutherford, Jr. (1911-1980) and his wife Dr. Evaretta Sims Rutherford (1910-1978) were prominent educators. The house was listed in the National Register of Historic Places in 1984.